How many times are theatre directors asked what it is they actually do? I somehow doubt they are called upon to justify their existence as often as orchestral conductors, their equivalent in classical music. I have always thought of the jobs as very similar. Essentially, both aim to create an environment in which a potentially disparate group of people can come together to make a singular piece of music or drama. Given the innumerable possible meanings that lie behind any symphony or play, especially the greatest ones, finding consensus isn’t straightforward. It is not a question of whose opinion is right or wrong. Just an acknowledgement that there needs to be a consistency of approach – a constant agreement on the emotional temperature of the performance, and when, why, and how this should fluctuate. Composers define the sounds, to a certain extent, just as playwrights prescribe the words. But it is not the creator’s role to restrict the imagination of those who perform their works. Quite the opposite in fact. There are just as many ways of saying ‘To be or not to be’ as there are of playing ‘Da da da dum’. Texts offer a climbing frame for creativity, not the imprisonment of a cage. And if every Hamlet or Beethoven’s Fifth Symphony sounded the same, few would want to hear them again and again and again. Neither music nor drama exists without those performing it, and it is the unique choices performers make that allow these pieces to remain alive and relevant. Ideally, conductors and directors enable musicians and actors to express themselves as individually as possible, while inspiring them to do so along a route that they have chosen for the group as a whole. Managing a broad coalition that still has a distinct vision as its aim might appear a contradiction to some, but achieving this – without any sense of artistic compromise – is definitely the goal. As neither directors (certainly) nor conductors (hopefully) make any noise in performances, fostering artistic unity demands an ability to influence others intangibly and requires an empathy more human than artistic. Understanding what actors and musicians want psychologically, as well as the more practical and creative support they need, is key. We have to be able to persuade others to take ownership of ideas they might not necessarily agree with. For, without this ownership, audiences will sense the second-hand nature of the expression – and if they think performers lack conviction, it is very unlikely they will be convinced themselves. No one much likes being told what to do, and that is particularly the case for those who join creative professions. Of course musicians and actors respect the inherent hierarchies they have signed up for, but the moment these contracts, either real or figurative, become self-conscious constraints you may as well give up and go home. This is why it is so unfortunate to read about orchestras performing ‘under’ a particular conductor. The phrase implies downtrodden musicians, and probably the music too, being ‘beaten’ into submission by some sort of indulged megalomaniac. Such a relationship can never result in music-making that reveals more than the limit of an individual’s experience. 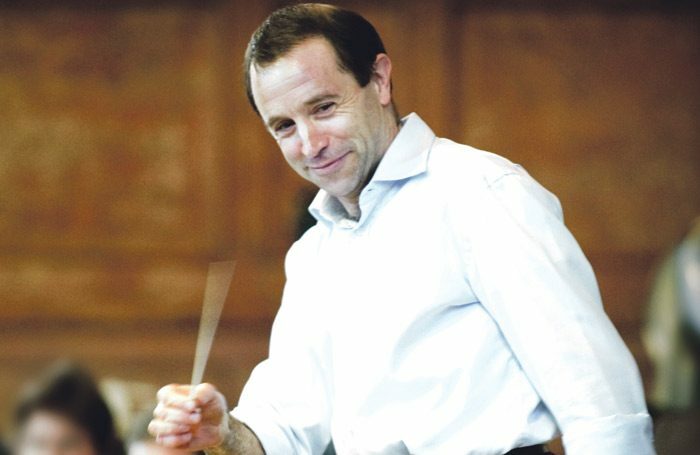 Conductors put their personality into the orchestra. But we have no right to own the personalities of the musicians in return. However, the public rarely sees it that way. And this, I think, is where perceptions surrounding conductors and directors diverge. Whereas theatre directors do their job ‘backstage’, audiences can watch the conductor at work. The impression of control and power is strikingly visible. And even though good conductors seek neither of those things, conventional concert paraphernalia can conspire against the notion of a democratic and collaborative approach. The conductor’s entrance and exit frame the whole performance. As the only person in the room standing up, you are always going to attract a certain amount of attention. But it is problematic that an art form that is not supposed to be about what you see should so often be embodied by someone you cannot hear. Even if the conductor’s aim is to dispel traditional authoritarian presumptions and empower the players to express a direct relationship between themselves and the music, a despotic stereotype is hard to contradict. Perhaps it is not surprising that observing conductors doing their job seems to be what generates the confusion surrounding it. Yet a collegiate and humble approach to leadership is that which performers appreciate the most, and is ultimately the most successful. The best conductors, just like the best theatre directors, achieve what they do through a natural authority that doesn’t need a contract or a podium to assert itself. Their power comes from a trust in those they work with, an openness to what they hear, and a willingness to respond to that without loss of face. This respect is then reciprocated, creating a virtuous circle that allows everyone to give their all. In both music and drama I believe the subtle approach travels the furthest. This form of leadership is at odds with our times. In political circles at least, views have to be extreme to be heard. Self-centred appears strong. Loud is good. The nuanced view struggles for air(time) and the most popular leaders are the ones who shout the most. Whether they have vision is considered to be secondary. People seem comforted by dogma. Music and drama, on the other hand, show that collaborative leadership works. It actually works very well. I am not suggesting that our finest conductors and directors should run the country, but I think they provide evidence that this form of leadership is not a utopian impossibility. People are happy to be led by a leader who is not too proud to follow. Editor's View: In cases like that of Ramin Gray at ATC, how can we find a route to rehabilitation?